Mikitaka first appears in chapter 378 (I Am An Alien! 1). He claims he's a 216 year old alien from the Mclon system looking for a planet his people to live in. His job is piloting a space shuttle and his hobby is raising small pets. He possesses the ability to assume any physical form he desires. Although he can take a form vastly smaller than his normal mass, and can separate himself into several components in the process, it is not known if he can take on a much larger form. On the negative side, if exposed to a siren or similar sound, he suffers a painful rash until the sound stops. 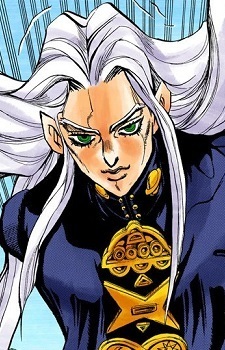 It was never revealed in the manga whether Mikitaka is a delusional stand user activated by the Arrow or truly an extraterrestrial life-form (he gives his full name as Nu Mikitakazo Nshi). According to JOJO!A-GO-GO artbook, his stand's name is Earth, Wind And Fire.